The claim had been circulating on Fox News. President Donald Trump tweeted Tuesday that the Obama administration granted 2,500 Iranians, including government officials, citizenship during the Iran nuclear deal negotiations, without any evidence it was true. "How big (and bad) is that?" Trump added, referring to the citizenship claim. 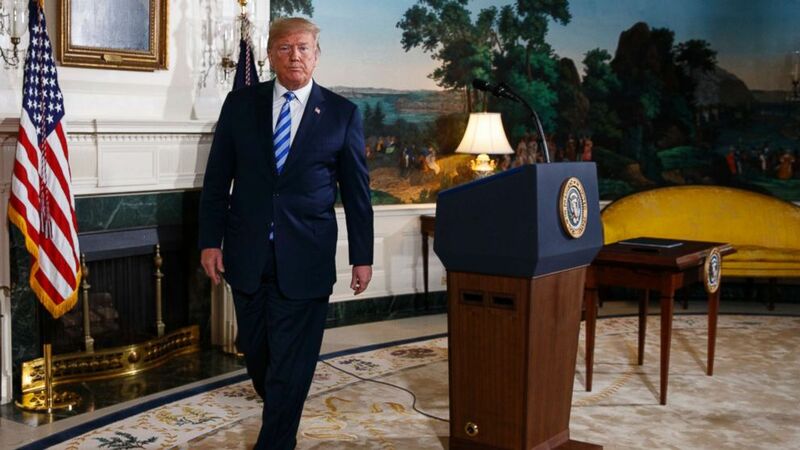 (Evan Vucci/AP) Donald Trump walks off after delivering a statement on the Iran nuclear deal from the Diplomatic Reception Room of the White House, May 8, 2018. The headline from Fox News, Sean Hannity, and others has been circulating for a couple of days now. But it is based on the unsubstantiated comments of one conservative Iranian cleric, trying to bash the more moderate President Hassan Rouhani and his administration. Iranian cleric Mojtaba Zolnour was attacking Rouhani and his government's senior officials as sell-outs, saying in an interview in June, "When Obama, during the negotiations about the JCPOA, decided to do a favor to these men, he granted citizenship to 2,500 Iranians and some officials started a competition over whose children could be part of these 2,500 Iranians," according to Iran's Fars News agency. Zolnour is a hardline member of Iranian parliament, who is helping lead an investigation on whether dual citizens have "infiltrated" Iran's government, according to Radio Farda, the U.S.-funded Iranian language news service. Iran has arrested a handful of dual U.S.-Iranian citizens that the Trump administration is trying to free. Zolnour is also a "troglodyte," a "low-rent dolt," and an "unhinged hardliner with an extreme agenda," tweeted Borzou Daragahi, a journalist and senior fellow at the Atlantic Council. Despite who made the claim – and that the State Department and the Department of Homeland Security have not confirmed it – several news outlets reported the story anyway, which Trump then tweeted. But there's no evidence it is true. So far, the White House did not respond to requests for evidence, and State Department spokesperson Heather Nauert said she saw the "report," but referred questions to the Department of Homeland Security. Obama administration officials are vehemently denying it. "The allegation is absurd and entirely false," Jeff Prescott, the senior director on President Obama's National Security Council, said in an email to ABC News. "It shouldn't be lost on anyone that this is a case of Donald Trump parroting Fox News, which is peddling the claims of an Iranian hardliner." According to statistics published by the Department of Homeland Security, there doesn't seem to be a significant rise in new U.S. citizens or lawful permanent residents from Iran over the last decade. There were 11,623 new U.S. citizens born in Iran in 2013; 9,620 in 2014; 10,344 in 2015; and 9,507 in 2016. There were 12,863 new legal permanent residents born in Iran in 2013; 11,615 in 2014; 13,114 in 2015; and 13,298 in 2016. Data for 2017 has not yet been published. The Iran deal negotiations started in 2013, and the pact was signed in 2015.